Honesty and Integrity of the individuals I have dealt with in both occasions that work has been done. "Everyone was great, job looks awesome." Basement Systems Vancouver is independently owned and has been gladly serving all of our great customers since 1996. We are the Distributor and Certified Installer for Cosella-Dorken's Delta-MS, Delta-FL and Delta Drain - cutting edge air gap membrane technology for all types of new and old foundation walls. We take great satisfaction in offering you the best custom solutions in solving your basement leakage problems and can also help prevent future leaks in your new home. 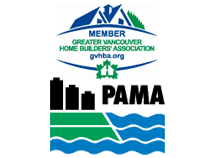 Rob and Gerald, owners of Basement Systems Vancouver, have been gladly serving the Lower Mainland and Fraser Valley areas of British Columbia area since 1996. They earn customer satisfaction by offering the best custom solutions that not only solve basement leakage problems, but also help prevent future leaks! As an authorized Basement Systems Dealer, Rob and Gerald have completed a rigorous training series at their International Headquarters and have successfully completed certification tests in the areas of installation, system service, waterproofing system design, and customer service. A warranty is only as good as the company that stands behind it. Our written, transferable warranty is backed by a National Basement Systems Warranty and specialized staff dedicated to seeing your problem through its resolution.